Could Politicians Force Meat to be Labelled Dangerous? The publication of the report by the International Agency for Research on Cancer (IARC), the cancer agency of the World Health Organization, evaluating the carcinogenicity of the consumption of red meat and processed meat was bound to cause a furore among both pro and anti-meat campaigners. The IARC report said that after thoroughly reviewing the accumulated scientific literature, a Working Group of 22 experts from 10 countries convened by the IARC Monographs Programme classified the consumption of red meat as probably carcinogenic to humans, based on limited evidence that the consumption of red meat causes cancer in humans and strong mechanistic evidence supporting a carcinogenic effect. Processed meat was classified as carcinogenic to humans, based on sufficient evidence in humans that the consumption of processed meat causes colorectal cancer. The IARC said that the consumption of meat varies greatly between countries, with from a few per cent up to 100 per cent of people eating red meat, depending on the country, and somewhat lower proportions eating processed meat. The experts concluded that each 50 gram portion of processed meat eaten daily increases the risk of colorectal cancer by 18 per cent. 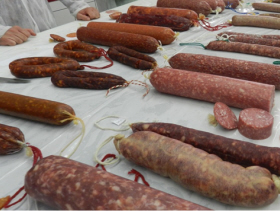 Dr Kurt Straif, Head of the IARC Monographs Programme said: “For an individual, the risk of developing colorectal cancer because of their consumption of processed meat remains small, but this risk increases with the amount of meat consumed. While there was an obvious reaction from the meat industry playing down the significance of the report and the vegetarian anti-meat lobby playing up dangers all spurred on by headlines in the popular press such as the Daily Mail in the UK “Just two rashers of bacon a day raises your risk of cancer: Health chiefs put processed meat at same level as cigarettes”, the report actually said little that was new. In July 2015, a Dutch report from researchers at the University of Utrecht had put forward similar claims about red meat and cancer. An earlier Swedish study found men, who ate large amounts of processed red meat, had a higher risk of death from heart failure. Research by the Harvard School of Public Health found that eating three rashers of bacon eaten per day raised the risk of breast cancer in women by more than 20 per cent. However, all the information goes back nearly a decade when the World Cancer Research Fund first published a report putting forward claims of a potential link. Reports from 2007 and 2011 from World Cancer Research Fund found strong scientific evidence that eating red or processed meat increases the risk of bowel cancer. The charity put forward recommendation for eating no more than 500 grams (cooked weight) of red meat each week, and eating little, if any, processed meat. The charity’s Head of Research Interpretation Dr Rachel Thompson said: “The results of this new evaluation (the IARS WHO study) are in line with our own findings from our comprehensive analysis of global scientific evidence, which shows eating red or processed meat increases the risk of bowel cancer. ”These findings further support current public health recommendations to limit intake of meat,” said Dr Christopher Wild, Director of IARC. Immediately the announcement was made by the IARC, the anti-meat campaigners jumped on the bandwagon and hyped up the dangers. In the US, the Physicians Committee for Responsible Medicine, which boasts a membership of 12,000 doctors, called for hot dogs to be banned from school meals and other institutions. It urged schools, hospitals, and public institutions to remove processed meats from menus and provide students and patients with cancer-fighting resources from its campaigning website DropTheDog.org. “Schools and hospitals are required to protect students and patients from cancer-causing asbestos,” said Physicians Committee director of nutrition education Susan Levin. However, the meat industry bodies were equally vociferous. The North American Meat Institute (NAMI) said IARC panel classifying red and processed meat as cancer “hazards” defied both common sense and numerous studies showing no correlation between meat and cancer and many more studies, showing the many health benefits of balanced diets that include meat. Scientific evidence shows cancer is a complex disease not caused by single foods and that a balanced diet and healthy lifestyle choices are essential to good health, NAMI said. “It was clear sitting in the IARC meeting that many of the panellists were aiming for a specific result despite old, weak, inconsistent, self-reported intake data, said Dr Betsy Booren, NAMI Vice President of Scientific Affairs. “They tortured the data to ensure a specific outcome. “Red and processed meat are among 940 agents reviewed by IARC and found to pose some level of theoretical ‘hazard.’ Only one substance, a chemical in yoga pants, has been declared by IARC not to cause cancer,” said Dr Booren. IARC’s panel was given the basic task of looking at hazards that meat could pose at some level, under some circumstance, but was not asked to consider any off-setting benefits, like the nutrition that meat delivers or the implications of drastically reducing or removing meat from the diet altogether. “Followers of the Mediterranean diet eat double the recommended amount of processed meats. People in countries where the Mediterranean diet is followed, like Spain, Italy and France, have some of the longest lifespans in the world and excellent health,” said Dr Booren. “IARC’s decision simply cannot be applied to people’s health because it considers just one piece of the health puzzle: theoretical hazards. Risks and benefits must be considered together before telling people what to eat, drink, drive, breathe, or where to work,” she said. While the arguments between the pros and antis will go on, the meat industry will continue to sell their products and boost its image through marketing campaigns. The potential danger will come when the politicians start to jump aboard and make capital out of it. House Resolution 839 awaits approval in the Illinois House of Representatives. But on the other side of the coin there are concerns that California could lead the way in making things difficult for the meat industry by using legislation to force the meat industry to carry health warnings in labels on meat products. California has a reputation in leading the ways in controversial legislation as when it introduced Proposition 2 that outlawed battery cages for laying hens forcing the US industry to look at its production methods across the country. There are suggestions that it could use Proposition 65 or similar legislation to bring in restrictions on meat trading and marketing. In 1986, California voters approved an initiative to address their growing concerns about exposure to toxic chemicals. That initiative, better known by its original name of Proposition 65, became the Safe Drinking Water and Toxic Enforcement Act of 1986. By providing this information, Proposition 65 enables Californians to make informed decisions about protecting themselves from exposure to these chemicals. The Office of Environmental Health Hazard Assessment (OEHHA) administers the Proposition 65 programme. OEHHA, which is part of the California Environmental Protection Agency (Cal/EPA), also evaluates all currently available scientific information on substances considered for placement on the Proposition 65 list. This entry was posted on November 9, 2015 by agedchrisharris in Cattle, Meat, Pigs, Sheep and tagged Cancer, meat, processed food.